Research in epigenetics helps to unravel the mysteries of major biological processes such as cancer, aging, and the development of diseases. It helps us understand how the environment might impact our gene expression and advances the traditionally-held view of the "code of life." 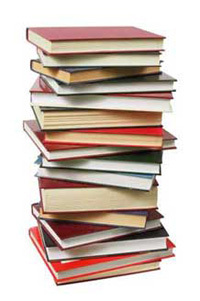 Best of all, researchers can start out with little more than DNA, histone proteins, or chromatin and investigate fascinating topics such as cancer epigenetics, neuropsychiatric disorders, nutritional development, metabolic diseases, novel therapeutics, and more - no matter what discipline they specialize in. The progress of epigenetic product development over the years has enabled low-cost exploration of epigenetic modifications, so it's easier than ever to gain a significant insight into samples a researcher may already be working with in the lab. Checking for epigenetic modifications could lead to the publication of new insights that might not have been previously considered. Epigenetics is the covalent modification to DNA that impacts gene expression without affecting the underlying genetic sequence. These various epigenetic marks act "above" or "on top of" the DNA code to influence the expression of genes. With advancements in next-generation sequencing (NGS), researchers are able to delve deeper into the nuances of their samples and determine where modifications lie at base-resolution. It's well known that this emerging field is becoming the focus of many researchers and labs across the world. 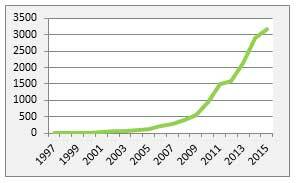 Epigenetic-related publications have been rising exponentially since the 2000s. Not only is the research space predicted to expand, but a larger number of grants for epigenetic research will likely be awarded. A significant portion of research in epigenetics focuses on DNA methylation (as well as its subset DNA demethylation), the most well-characterized epigenetic mechanism, and this is an ideal place to start for those just beginning. 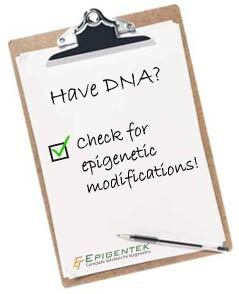 Scientists can make their mark in epigenetic research by investigating this and many other epigenetic modifications. Do you have genomic DNA, chromatin, or histone protein samples? Then you're ready to get started in epigenetics! » See a complete offering of sample preparation kits for DNA, protein, and chromatin prep using a variety of starting materials and input amounts. DNA Methylation occurs by the addition of a methyl group (CH3) to DNA. DNA methylation is defined as the addition of a methyl group to DNA, specifically cytosine, by an enzyme known as DNA methyltransferase (DNMT), thereby affecting gene expression. This epigenetic mark typically reduces the expression of genes and is involved in normal processes such as aging and cell differentiation, but is also thought to play a role in the development of diseases such as cancer, Alzheimer's disease, and many others. As the first epigenetic mark to be discovered, DNA methylation continues to be a major focus of numerous epigenetic researchers. Easily jump-start your epigenetic research by looking at global DNA methylation. The easiest way to begin research in epigenetics is by investigating global DNA methylation. 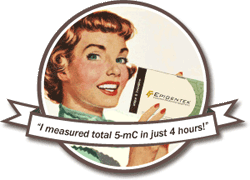 Measuring total 5-methylcytosine (5-mC) levels may reveal possible epigenetic factors at play and offer invaluable insight into your samples. Global DNA methylation can vary between sample sets such as diseased versus healthy, between various tissue or cell types, and even between identical twins. Global hypomethylation and hypermethylation are linked to cellular processes such as aging, tumorigenesis, and disease development. It has been implicated as a biomarker in numerous human cancers and could help assess neurodegenerative diseases such as Alzheimer's and Parkinson's. Importantly, research has shown that decrease in global DNA methylation is one of the most important characteristics of cancer. In addition, global DNA methylation quantification is an excellent pre-screening tool that many researchers carry out prior to time-consuming and often costly sequencing, which is typically the path one would pursue for more in-depth investigation. See a global DNA methylation methods comparison chart for an overview of the advantages, disadvantages and capabilities of global DNA methylation methods, including HPLC, LC-MS/MS, LUMA, and ELISA-based assays. Common global DNA methylation methods include HPLC, LC-MS/MS, LUMA, and M.SssI acceptance assays. HPLC uses enzymatic hydrolysis of genomic DNA and typically requires large amounts of sample DNA. Furthermore, optimization of the procedure requires extensive expertise. LC-MS/MS is considered the "gold standard" for quantification of global DNA methylation and similarly digests and separates deoxyribonucleotides, but analysis by mass spectrometry requires highly specialized knowledge. LUMA is a method that relies on cleaving the DNA with methylation-sensitive restriction enzymes followed by pyrosequencing. It isn't conclusive as to whether or not the results from this method accurately represent global DNA methylation. Lastly, the M.Sssl acceptance assay requires radioactivity for analysis and utilizes CpG DNA methyltransferase M.SssI and methyl donor S-adenosylmethionine. Unfortunately, this assay often leads to large intra- and interassay variability if the enzyme activity or stability of the methyl donor SAM is sub-optimal. DNA Methylation Modulates Nociceptive Sensitization after Incision. Sun, Y et al. (2015). PLOS ONE. In this global DNA methylation study, researchers investigated the role of DNA methylation in modulating pain after incision and identified methylation-regulated targets contributing to incisional pain including the Oprm1 gene and others. The researchers measured global DNA methylation using the MethylFlash Methylated DNA Quantification Kit. » See more global DNA methylation studies. A global DNA methylation assay is a fast and inexpensive pre-screening method for those just starting their epigenetic study. A slightly more advanced method for beginners looking to start in DNA methylation research is gene-specific, base-resolution DNA methylation analysis. This assesses the amount of DNA methylation of a specific gene at base resolution, compared to global DNA methylation, which provides an overall view of the entire methylation status of the genome. The BisulFlash DNA Modification Kit is the ideal kit for quick bisulfite treatment of DNA geared towards methylation-specific PCR analysis. MSP begins with bisulfite conversion wherein unmethylated cytosine is converted to uracil. In subsequent PCR amplification, uracil is recognized as thymine, leaving the methylated cytosines (5-mC) unaffected. This allows the amount of methylation to be measured. Protecting against DNA degradation caused by the typically harsh chemical reaction is vital in order to ensure optimal recovery and accurate methylation status. For those just beginning epigenetic research, next-generation sequencing (NGS) may seem daunting. There is typically a lot of data produced and significant time must be devoted to interpretation and figure generation. Massively-parallel sequencing platforms, such as Illumina or PacBio, have become invaluable tools that revolutionized genome and epigenome analysis. NGS gives researchers a deeper and far more detailed look into their samples than ever before. NGS technology delivers robust, unprecedentedly high-quality data. Common DNA methylation-based applications include whole genome (WGBS), reduced representation (RRBS), and targeted bisulfite-seq. Successful bisulfite sequencing projects start with complete and efficient bisulfite conversion. Samples can be sequenced on an Illumina instrument for precise identification of methylated genes of the sample. The EpiNext High-Sensitivity Bisulfite-Seq Kit (Illumina) is ideal for streamlined bisulfite sequencing NGS library preparation from low input DNA. Because it’s an all-in-one kit, it includes everything needed for bisulfite conversion and library preparation and is excellent for beginners. Histone modifications occur by adding an acetyl group (histone acetylation) or a methyl group (histone methylation) to the histone tails via specific enzymes. Investigating histone modifications is another route to pursue for those just getting started in epigenetic research. Post-translational modifications (PTMs) which occur to histones are thought to play a crucial role in transcription repression or activation. Such histone modifications include histone methylation, histone acetylation, and histone phosphorylation. These epigenetic mechanisms and the way they impact chromatin structure or recruit histone modifiers brings us closer to understanding the factors that alter gene expression and the consequences of these changes. Similar to beginning in global DNA methylation research, when getting started in histone modifications it is very useful to have an overview of your samples. This will save time and effort in the future and can help narrow down areas for further experimentation. Investigate 21 different histone H3 modifications or 10 different histone H4 modifications on one microplate using the EpiQuik Histone H3 Modification Multiplex Assay Kit or the EpiQuik Histone H4 Modification Multiplex Assay Kit. This high throughput method will accurately quantify amounts of identified histone proteins at specific H3 or H4 modification sites present in your sample prior to getting involved in more advanced downstream applications such as ChIP-sequencing (ChIP-seq). Chromatin immunoprecipitation, or ChIP, is a popular epigenetic research method for investigating protein-DNA binding interactions. This method can be used for identifying histone modifications at the gene-specific level. Chromatin immunoprecipitation involves the binding of proteins to particular DNA sequences, allowing researchers to investigate transcription factors that interact with target genes and histone modifications occurring at genomic locations. Briefly, it involves crosslinking proteins to DNA, shearing the chromatin via sonication, and immunoprecipitating with a specific antibody. Then, the protein-DNA complexes are reverse crosslinked so the DNA fragments can be analyzed. Various downstream applications of ChIP include ChIP-sequencing, ChIP-PCR, and ChIP-on-chip (microarrays). The ChromaFlash High-Sensitivity ChIP Kit is optimal for immunoprecipitation of chromatin (ChIP) from small amounts of mammalian cells or tissues. For an in-depth technical guide to ChIP, see A Starter Chromatin Immunoprecipitation (ChIP) Protocol at What is Epigenetics? or read the three-part series A Technical Guide to Conquering ChIP by David Esopi, research specialist at Johns Hopkins Sidney Kimmel Comprehensive Cancer Center. Genome-wide mapping and identification of histone modifications. This method combines chromatin immunoprecipitation (ChIP) with massively parallel sequencing technology to precisely analyze protein interactions with DNA. ChIP-Seq is used for pinpointing the exact gene location to which the protein of interest binds, but like bisulfite sequencing, produces significant amounts of data. Use the EpiNext ChIP-Seq High-Sensitivity Kit (Illumina) Kit to perform ChIP and library preparation in a single kit. Explore the epigenome the easiest way possible with our comprehensive epigenetic services, which can be completed from sample preparation to bioinformatics. Just send us your samples and we will send you publishable figures and results, along with personalized technical support at your fingertips.